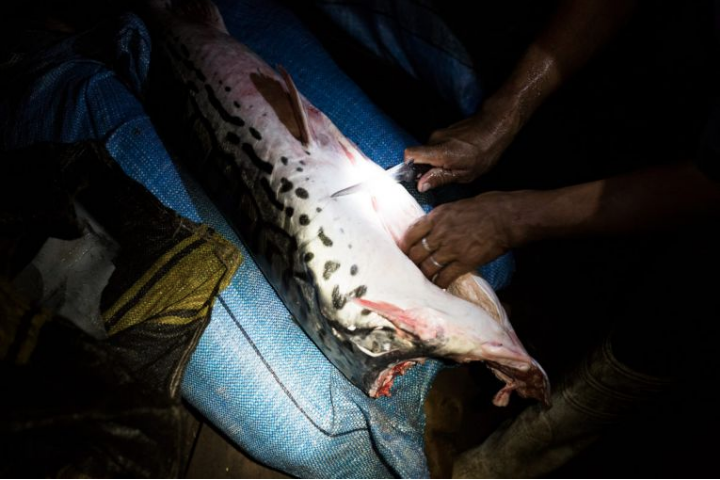 Fishermen use machetes to hack away the giant scales of the invasive paiche before skinning them and casting the refuse into the river. Growing up to three meters and 250 kilograms, the paiche (Arapaima gigas) is the largest scaled fish in the Amazon and one of the largest freshwater fish on earth. Image by Felipe Luna. Bolivia, 2018. It was sunset along the Lago Mentiroso, or Lying Lake, a narrow bow of water north of the Madre de Dios River, deep in Bolivia’s Amazon Basin. Blue macaws shrieked high over the dark, still water. Fireflies gathered in the water hyacinth that fringed the lake’s edge. Every so often, a deep porcine grunt and a heavy splash echoed out from under the tall, dark naves of half-submerged roots. “Una vaquita,” whispered Jairo Canamari, one of four fishermen from the nearby village of Trinidadcito who’d brought me out to the lake that day—a little cow. 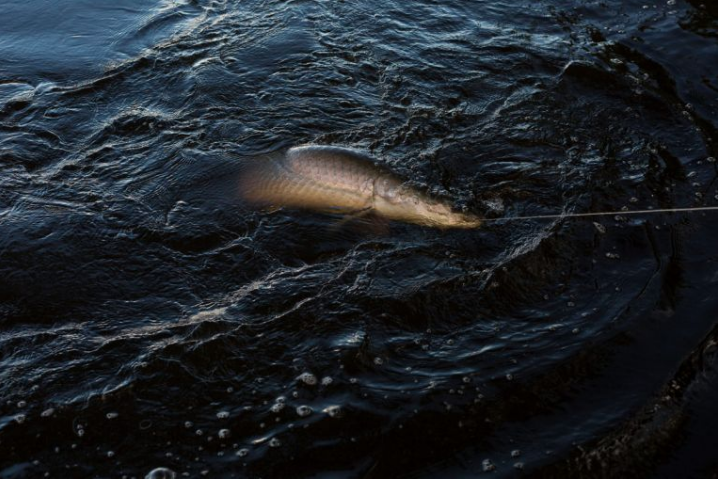 It’s one of several names used for the giant, invasive fish that, in the last forty years, has become both a plague and a blessing in this remote corner of Bolivia. Twenty-six and slight with close-cropped hair, Canamari stood at the helm of our ten-foot canoe, parting the reeds and canes as his older brother Rafael, who sat silently at the back of the boat, rowed us to shore. Gabriel and Ahismed Justiniano Montaño, also brothers, took the middle of the boat, Ahismed with paddle in hand, Gabriel rolling sticky tobacco into graph paper. The hull was already filled with the still bodies of red, yellow, and silver piranhas caught earlier that afternoon for the next morning’s breakfast. At any hint of the big fish, Ahismed’s attention darted like a cat’s toward the origin of the sound. Gabriel blew fragrant smoke through his nostrils: “It keeps the caimans and snakes away,” he explained. He was whispering too. That’s what you do when there are paiche around. The surubí, a species of catfish native to the Bolivian Amazon and an important source of protein for rural communities there, has grown scarce in the years since the paiche first arrived in the region. Image by Felipe Luna. Bolivia, 2018. Growing up to eight feet long and five hundred pounds, the paiche is the largest scaled fish in the Amazon and one of the largest freshwater fish on earth. Its torpedo-shaped body is covered in glossy black scales, while its head is plated in armor the color of moss. At night, its eyes shine Day-Glo green, like some kind of Miocene zombie. When the first paiche turned up in the Lago Mentiroso, sometime in the early 1980s, no one knew what it was or where it had come from. Rumors spread quickly, often faster than the fish itself. In the town of San Buenaventura, just south of the paiche’s current range, stories circulated of it attacking humans. In other villages, some won’t eat the paiche because they believe its brain is infested with worms. In Guayaramerín, on the Brazilian border, a fisherman told me, “When the paiche gets mad it’ll capsize your boat with its tail.” In Las Peñitas, a day’s drive from San Buenaventura, one fisherman claimed that paiche can swim backward to get around nets. Another said he’d heard they were raised by Peruvian scientists and nursed on the blood of cows. Ruth Isabel Vazquez, a fish buyer in the city of Riberalta who goes by the name Doña Chuli, remembers first hearing about the paiche on a radio broadcast in the early 1980s. “They’d domesticated it or maybe they wanted it for a museum or a zoo, so it was like some kind of a queen for them,” she told me. “She had a golden crown on her head and we were all looking to capture her.” Out on the Mentiroso two nights later, I asked Gabriel and Jairo if they’d ever heard about the paiche queen. Gabriel replied, “The one with the crown? That’s true. But they never found her.” Jairo flashed a warm, conspiratorial smile. “That’s because she’s here in the Mentiroso,” he said. “Nowadays we live in a very explosive world,” writes English biologist Charles Elton in his 1958 book, The Ecology of Invasions by Animals and Plants, considered the foundational text of invasion biology. “An ecological explosion means the enormous increase in numbers of some kind of living organism,” he continues. “… I use the word ‘explosion’ deliberately, because it means the bursting out from control of forces that were previously held in restraint by other forces…. Ecological explosions differ from some of the rest by not making such a loud noise and in taking longer to happen.” As far back as Darwin’s time, biologists have identified the phenomenon of invasive species—sometimes referred to as “naturalized” species—but they were mostly seen as oddities. It wasn’t until Elton that invasives were understood as a serious threat to global ecosystems. Twenty years after he published his seminal text, the paiche exploded silently into Bolivia’s ecosystem. Its full impact wouldn’t be felt for decades. The paiche has been the top predator in the slow-moving rivers and oxbow lakes of the northern Amazon for five million years. It consumes anything that fits into its huge, hinged jaws—mostly other fish, but also seeds, leaves, stones, and mud. In its native habitats, principally in Peru and Brazil, the paiche has been an important part of the human diet for as long as people have had the implements to hunt it. 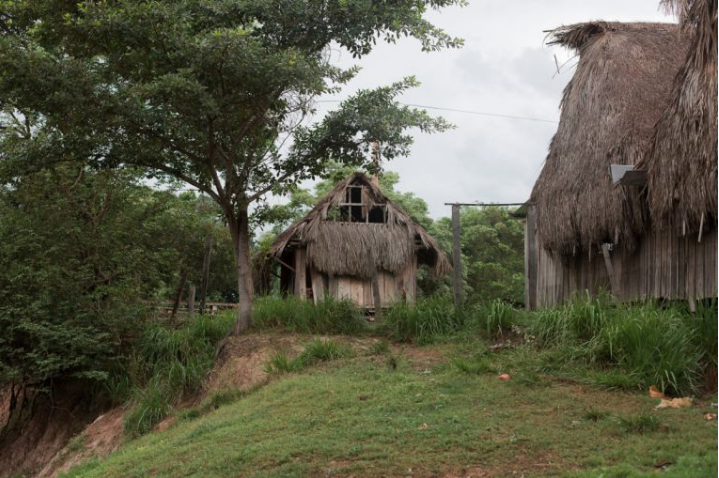 One origin story from the Uaia tribe, native to the western Brazilian Amazon, is nearly as fearsome as the rumors that have spread across Bolivia over the last few decades. Pirarucu, as the fish is called in Brazil, was originally a brave but cruel warrior prince who angered the gods through blasphemy and wanton violence against his own people. One day, while the warrior was out fishing, the gods conjured a storm, scattering his companions and striking him in his heart with a bolt of lightning. He fell into the river and sank into its depths, where he was transformed into a dark fish that terrorized the region for years. Even in its native habitat, the big fish is sinister and mysterious, emerging from an unnatural conflict with the divine, not from nature itself. Gabriel Justiniano Montaño, twenty-four, caught his first paiche at the age of twelve. The giant fish pulled so hard it brought him to his knees. Image by Felipe Luna. Bolivia, 2018. Eventually, the warrior prince became the hunted. Riverside communities in Peru and Brazil, as well as in Colombia, Ecuador, and Guyana, where the paiche is found in smaller numbers, used spears, harpoons, bows and arrows, and throw nets to catch the fish when it surfaced to breathe every fifteen to twenty minutes. By 1975, when the United Nations passed the Convention on International Trade in Endangered Species, or CITES, the paiche was listed as a species at risk of endangerment. Exporting the fish was banned. Around the same time, farmers in Peru and Brazil started raising paiche to relieve pressure on wild populations. Some paiche farmers soon noted that the fish could also be a prime candidate for export: it is fast-growing, fecund, protein-rich, and totally lacking in intramuscular bones. By 2012, Time was hailing the success of Peruvian paiche farms. Two years later, Whole Foods started stocking the fish as a sustainable alternative to Chilean sea bass, whose firm texture and mild flavor paiche meat closely resembles. Chilean sea bass—the market-friendly name for a species called the Patagonian toothfish—had been stamped with controversy since the early 2000s, but farmed Peruvian paiche, Whole Foods alleged, was actually helping to save paiche in the wild, billing consumption as conservation. A study published in the journal Aquatic Conservation: Marine and Freshwater Ecosystems that same year corroborated the claim: communities in Peru and Brazil with management plans in place, often including fish farms, had seen a significant improvement in paiche density in the wild, while those without such plans had, in most cases, fished the species to local extinction. Alison Macnaughton, a biologist who works with World Fisheries Trust, a Canadian charity, describes Brazil’s system as “the holy grail of fisheries management.” Communities there have developed a scheme for accurately counting their fish stocks—a rare feat, she says. The project to save the paiche in its native habitat has thus far been a success. That same project also sparked an ecological disaster. In the late 1970s, floods breached the embankments around Lake Sandoval, in southern Peru, where the Peruvian government had been incubating young paiche. Baby fish—no one knows how many—escaped into the Madre de Dios River, which feeds Bolivia’s Amazon Basin. Since then, the paiche has moved at an average rate of twenty miles per year, unusually fast for a nonmigratory fish. The paiche spends dry seasons building round nests around the silty edges of lakes, feeding on the young of native species that use the same habitats to breed. The paiche lays thousands of eggs at once and can successfully raise broods of hundreds, which it fiercely protects from other fish. When the spring rains come and the lakes reconnect to the rivers, the new generation of paiche infiltrates the main stem of the river and moves up- or downstream to new hunting and breeding grounds. The only significant obstacles to the paiche, seemingly, are rapids. 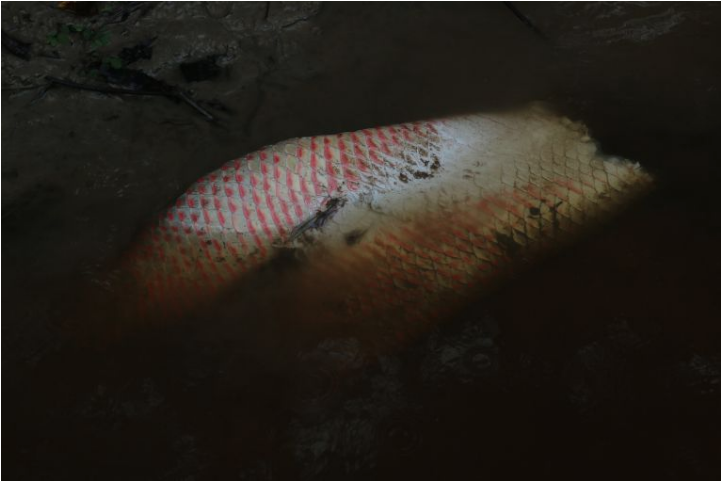 Though there is not yet definitive scientific data to prove that the paiche has damaged local populations of fish, every fisherman I met said that native species have been disappearing for years, and that the paiche is to blame. Until the 1970s, when the Brazilian government built an ice factory in a border town across the river from Guayaramerín, people in this part of Bolivia’s Amazon fished almost exclusively for subsistence. The first foreign settlers arrived in the forest region only a century before, displacing the largely nomadic Esse Eja, Cavineño, and Takana indigenous groups that historically populated the forest. The settlers were mestizos from across Bolivia and Brazil, as well as foreigners from places like Germany, Japan, and Turkey who came to tap latex for a fast-growing international market. In the twentieth century, as synthetics replaced natural rubber, the economy shifted to timber, brazil nuts, and, for a few years in the 1980s, gold. 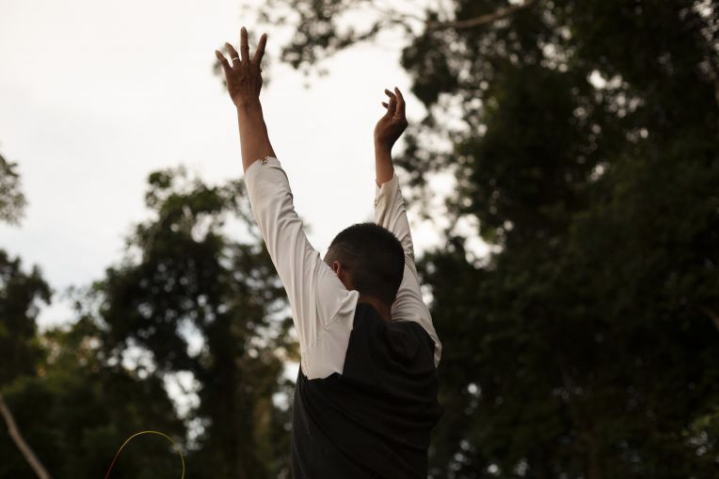 Most of the families currently living in Trinidadcito arrived during the rubber boom: Ahismed and Gabriel Justiniano Montaño’s grandfather came to work as a foreman on a nearby rubber plantation; Carlos Cruz’s father came as a laborer. Rubber and nut dons sold tobacco and liquor to their poor employees, including formerly nomadic indigenous peoples, in a system known as the habilito, feeding addictions that kept workers in debt and wages low. Northern Bolivia has been a region of boom and bust for a century and a half, its fortunes densely concentrated in the hands of a few. Donald Dorado Araú comes from a family of fishermen in the border town of Guayaramerín. Since his brother’s death, eight months ago, he’s dedicated his time to building a fishermen’s association for nearby communities in order to fix a fair price for their catch. Image by Felipe Luna. Bolivia, 2018. Sereve began her fishing business during the boom years of the 1990s. “At first I had six boats, then I lost one, then my husband divorced me and he took two more,” she said, laughing, as we sat one night at a small restaurant she runs on the riverfront. “Now I have three boats and I’m sticking to that. I’m the only person in Riberalta who has a whole supply chain.” Sereve hires fishermen to go upriver for two or three weeks at a time to the distant reaches of the Beni River, in areas where the paiche has arrived only in the last decade. Rather than buying from local fishermen—as her chief rival, Doña Chuli, does—Sereve pays a flat fee of 2,000 bolivianos (about $290) to each community for permission to fish there. When the catch returns, she processes and vacuum-packs paiche burgers, sausages, and nuggets at a small plant in her home. She then sells to clients in Bolivia’s interior cities. In a slow month, she said, she will export 8,800 pounds of paiche, a dramatic improvement from the early days, when filets were marked as surubí to entice buyers. Most vendors in urban markets have started selling the paiche under its own name only in the last five years. Since 2011, the annual paiche catch in northern Bolivia has more than doubled. The single species brings in about three-quarters of a professional fisherman’s annual income. In rural communities, where income sources tend to be more diversified, fishing generates about 20 percent of the total annual income, half of that from paiche. Though large-scale outfits like Sereve’s can target the paiche using nets with extra-large openings, most fishermen can’t afford such specialized equipment, which means that many of them continue to extract the same native species they fear the paiche is driving toward extinction. And with ever greater numbers of people turning to the rivers to supplement their income, the pressure on local species continues to grow. From an ecological standpoint, the paiche’s arrival has been disastrous. Throughout Bolivia’s vast Amazon Basin, rural villages have been transformed by the arrival of the paiche, which now provides a source of income throughout the year. Image by Felipe Luna. Bolivia, 2018. That won’t be easy. Until last year, when the Senate passed the Sustainable Fisheries and Aquaculture Law, Bolivia had never had a dedicated fishing law on the books. To develop the law, Rivero’s offices worked for five years with fishermen in Bolivia’s three primary watersheds. Local embargo rules, his team found, had little effect. Yet at all times, the same fishermen extracting the fish acknowledged the need for government intervention to preserve their fish stocks in the form of stronger legal restraints and financial support to purchase specialized equipment and to offset their losses in a strictly enforced embargo season. Without those systems in place, fishermen told me, they couldn’t afford to stop fishing during the embargo season, and had no incentive to do so. “They were aware that they needed to have some controls in place,” Rivero told me. “There is a void—a void that, finally, it’s the task of the state to fill with law. The point of the law is to resolve all this.” Eighteen months later, the Ministry of Rural Development and Land has yet to pass the specific regulations that would make the law practicable; in its current state it does little more than set up a federal administration that will monitor and gather data on fishing. Just about the only thing it formally criminalizes is fishing with explosives. Jairo Canamari fishes for paiche. Fishermen from the village of Trinidadcito in northern Bolivia have reshaped their entire economy around the arrival of the paiche in the Lago Mentiroso—or Lying Lake—which lies a short distance upstream. Image by Felipe Luna. Bolivia, 2018. With paiche catches expanding in both volume and area each year, the market may soon become saturated. The international conservation laws designed to protect a threatened species—the same laws that indirectly sparked an invasion—could end up dealing a serious blow to the livelihoods of those most affected by that species’s arrival. Just as rumor moved faster than the fish, the fish has moved faster than the law. Nowhere are the inadequacies of conservation law clearer than on the banks of the Mamoré, the broad, fast-flowing river that separates northeastern Bolivia from southwestern Brazil. 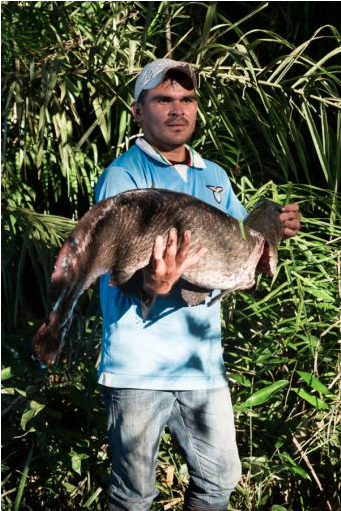 In the village of San Lorenzo, fishermen first spotted the paiche only four years ago. (Scientists say the paiche was almost certainly there before, but not in significant enough numbers for anyone to notice.) Now they’re pulling fish by the dozen from the water that flows just feet from their front doors. San Lorenzo is a tiny place: a dozen or so houses lined up along a single dusty street that runs parallel to the river, shaded by towering mango and tamarind trees. There’s a defunct water tower, a small, unused park by the river, and a soccer field long since overtaken by grazing cattle. When the fishermen who live here leave their houses each morning, the first things they see are the Mamoré and, on the other side, Brazil. Twice a day, speedboats rip past the opposite bank. One boat transports villagers to another town, on the Brazilian side; the other is a police boat monitoring the river for illegal activity, which mostly means fishing in an area that has been protected since the 1970s as a wildlife reserve. From Bolivia, the Brazilian side of the river looks simultaneously like the primordial past and the encroaching future. On one side of the Mamoré, the paiche is invasive; on the other, it’s threatened. On the night I arrived in San Lorenzo, I went to the banks of the river with Samuel Surubí, a local fish buyer who serves as a one-stop shop for beer, coca, and tobacco—the three intoxicants fishermen use to pass the hours on the water (the habilito is alive and well). Surubí met two fishermen who’d just returned with their haul from a short distance downriver. 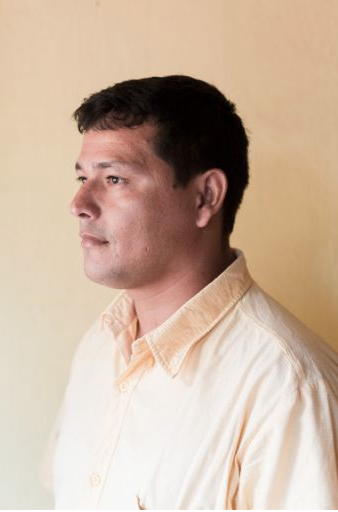 Raúl Chavez Parada, nicknamed Cata, and his partner, Josué Castro Barveris, dragged twelve paiche from the hull of their boat and laid them out like tally marks in the mud. The smallest of the catch weighed thirty pounds, the largest twice that—puny, everyone agreed. Rolando Reí Pereira, or Roli, a twenty-five-year-old fisherman, stood by the water’s edge and swung a pail of burning egg cartons like a censer, sending off clouds of gray smoke in an unsuccessful attempt to keep the armies of mosquitos at bay. Cata’s older brother, Jesús Chávez Parada, or Papayo, aimed an unsteady flashlight at the fish. Their green eyes lit up like lanterns. Josué, his cheek distended by a wad of coca, bent low over the long, dead bodies and broke them down one by one, opening their armored skin like a jacket, cutting around the soft joint at the neck, removing the head and the guts with a single tug, and scraping away the slick mesh of lungs. Hogs waited in the brush to carry away the discarded viscera. The next day, I crossed to the Brazilian side of the river to meet Antonio Medero, a fisherman in a settlement called Deus Que Me Deu (“what God gave me”). He told me about the Brazilian buyers who, starting in the early 2000s, came to Bolivian villages to buy baby paiche to stock their fish farms across the river. Wary of being caught transporting a protected species, they would dump the young paiche overboard whenever they saw customs agents approaching. Brazilian authorities have gotten only more rigid in recent years. Though Medero knows of nearby lakes infested with paiche, and knows that he could pull hundreds of pounds from the river just outside his front door as the men in San Lorenzo do, he refuses to fish it—the risk of getting caught selling paiche in the market is too great. “How will they know which side it came from?” he asked. “The fish doesn’t speak Spanish or Portuguese. Here it’s all prohibited.” Medero was less concerned with the absurdity of the rule than with the consequences of breaking it. Fishermen in Bolivia are still just learning to catch the invasive giant. In Lago Mentiroso, they use only fishing lines. Elsewhere, fishermen use nets, which are more efficient, but which also capture native species. Image by Felipe Luna. Bolivia, 2018. Humans instigate most invasions and have the language to define them, but we’re not the only animals affected. Today, invasive species are the second-largest cause of extinction worldwide, after habitat destruction. To defuse these ecological bombs before they obliterate global biodiversity, we turn to law, and to science. Yet for the most part the negative effects of invasives can be dealt with only by prevention. By the time a species makes its presence known, it’s often too late to stop its invasion. The laws we use correspond to borders and nation-states that are themselves constructs. In the case of the paiche, those borders and laws have only exacerbated the fish’s spread. While scientists use the word invasive, the fishermen I met, without exception, described the paiche as “unnatural,” a disruption of what their environment is supposed to look like. But the idea of nature as a perfectly calibrated machine is a human invention, as much a legend as the Uaia story of a warrior transformed into a fish. Extinction, change, and flux are all natural. When an invasive species as large and frightening as the paiche arrives, a phenomenon that our laws and borders are inadequate to contain, it blasts our fragile controls to pieces, and reminds us that nothing is permanent—neither nature nor ourselves. And yet this fish is also the future. In Trinidadcito and Riberalta, the communities most thoroughly transformed by the paiche, it is now essential. If villages like Trinidadcito have not become prosperous, at least they are viable places to live. Trinidadcito has decided to restrict all fishing to lines and to ban the use of nets. It guards the entrance to the Mentiroso to keep others out. Carlos Cruz, the most nostalgic of the fishermen I met, said proudly, “In Trinidadcito we only work in a sustainable way.” Rivero, the senator, told me, “We can’t look at [the paiche] as a negative influence. It’s something that already exists. It’s already there.” Even in San Lorenzo, where the fish is still a subject of both anger and fascination, many fishermen have grudgingly accepted the paiche as part of their livelihoods. This story was sponsored by a grant from the Pulitzer Center for Crisis Reporting. The photography featured was sponsored by a Memorial Fund Honoring Harriett and Seymour Shapiro and Carl Shapiro.